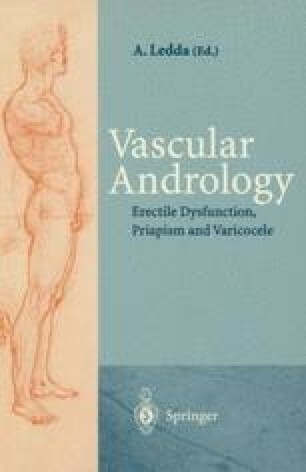 Intracavernosal pharmacotherapy became popular between 1982 and 1983 when Virag  and Brindley  demonstrated that injection of papaverine, phentolamine, and phenoxybenzamine into the cavernosal body induces a penile erection. One year later Virag  proposed a therapeutic protocol based on “self-injection”. Patients suffering from penile erectile deficiency were examined, and those who showed a favorable response to intracavernous injections of papaverine were taught a technique that provides a “self-erection”. Zorgniotti and Lefleur  in 1985 proposed a combination of papaverine and phentolamine, and immediately thereafter the use of prostaglandin E1 (PGE1) became a common practice. This drug was preferred over the others because of its lower rate of side effects, prolonged erections, and priapism than that with papaverine or papaverine + phentolamine. Today the use of these drugs has become routine, and constitutes either singularly or in combination the first step of every therapeutic protocol that deals with erectile dysfunction.